Within 45 minutes of the polls closing in Virginia, it was apparent that Obama was doing well enough in predominantly white, western Virginia to carry the state. The only outstanding questions were black turnout and Obama’s margins in northern Virginia. Most assumed that black turnout would be much higher than it was in ’04, but whether Obama could repeat his ’08 performance among African American voters was more of an open question. Few, if any, predicted that there would be areas where Obama would do better among black voters than in 2008, and yet that’s exactly what appears to have happened—not just in parts of Virginia, but in many predominantly black areas across the country. Although the exit polls indicate that black support for Obama fell from 95 to 93 percent and turnout held at 13 percent of the electorate, a quick glance at the results map shows that black turnout or support for the president might have exceeded '08 levels. Compare the map of areas where Obama did better than he did in ’08 (marked by blue) with a map of the black population in the United States. Unless white turnout fell in predominantly black areas, the strong correlation between Obama’s gains and the presence of a large black population suggests that Obama did at least as well, if not better, than he did four years ago. As Harry Enten of the Guardian observed, the pre-election polls also showed an increase in black turnout. Across the entire lowland south, Obama won a larger share of the vote than he did in 2008. Not only did Obama perform better among black voters than in '08, but Obama's gains were sufficient to overwhelm losses among white voters. Obama even matched and exceeded his performance in many black counties in North Carolina and Virginia, where one would have suspected that Obama would have already maximized black turnout and support. In 11 predominantly black counties in southeastern Virginia, turnout increased and Obama won more votes than he did in 2008. Obama’s margin of victory in Ohio was almost entirely attributable to historic levels of black turnout in Cleveland, Cincinnati, Columbus, and Toledo. 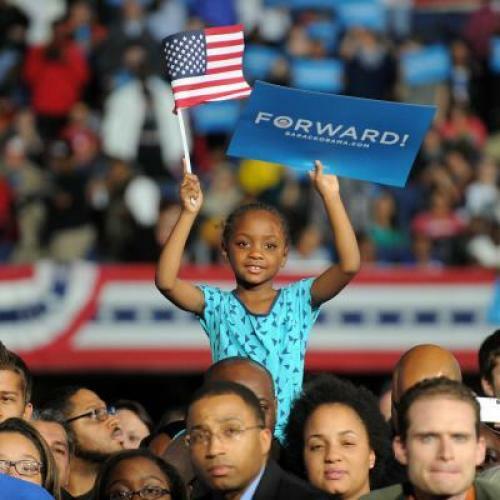 It seems hard to imagine that the next Democratic presidential candidate will approach Obama’s performance among black voters, but exactly how close the next Democratic candidate comes will matter a lot. In fact, African American turnout could be more important to the outcome of the 2016 election than the ability of Republicans to rekindle their support among Latino voters. A 10 point shift among Latino voters toward the GOP is worth a net-1.5 million votes nationally—even if the Latino share of the electorate increases by another 2 percentage points. But between 3 and 4 million new black voters joined the electorate over the last two cycles, and they voted for Democrats in overwhelming numbers. If black turnout returns to 11 percent of the electorate and the next Democratic candidate only wins 90 percent of the black vote, there’s room for a shift of a net-4 million votes in the GOP’s direction. Whether those 4 million voters stay home or return to their Republican-lean from eight years ago could easily decide a close presidential election, especially in states like Ohio, Virginia, Pennsylvania, and Florida.